Dinosaur Wall Mural. Original oil painting by Josef Moravec. TIME - 156 - 145 MYA, Late Jurassic period. STEGOSAURUS armatus was an ornithischian dinosaur, belonging to the groups Thyreophora and Stegosauridae. It was the largest Stegosaurus and one of the last of them. This well known dinosaur was a plant eater, it probably ate plants no taller than about three feet (1 m), mostly ferns, cycads and conifers. It is still debated, whether it actually could reared up on its hind limbs to get higher vegetation. Stegosaurus lived in vast flooded areas and forests, climate was warm and moist. Stegosaurus, the name of which means "armored roofed lizard", was a large, heavy limbed, long tailed and short legged dinosaur. It walked on all four legs, but it could not coordinate the movements of such a long body. Its rear legs were twice as long as its front legs. Hind limbs had three toes, fore limbs had five toes. Its head was extremely small in relation to its long body. It had a toothless beak and small cheek teeth. Two rows of triangular shaped plates ran the course of its back, leading to its long tail, which displayed four long spikes. Its largest plates were over two feet (60 cm) high and wide (the largest plate was 2,5 feet/76 cm high and 79 cm long). Recent excavations indicate, that the plates were in two alternating rows. The plates are now thought by many to help control body temperature, but they could also have been used for display. The tail spikes were hold horizontally, they were probably weapons of defense. 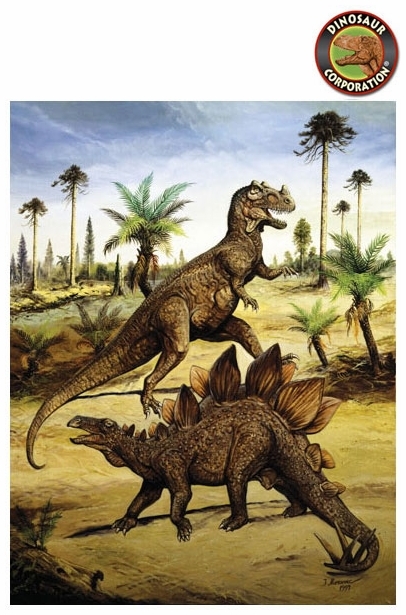 The other weapon of Stegosaurus probably was armor-like scutes (small osicles) on the skin of the throat and the hips. RANGE - Wyoming, Utah, Colorado. SIZE - 25ft (7 m) long.